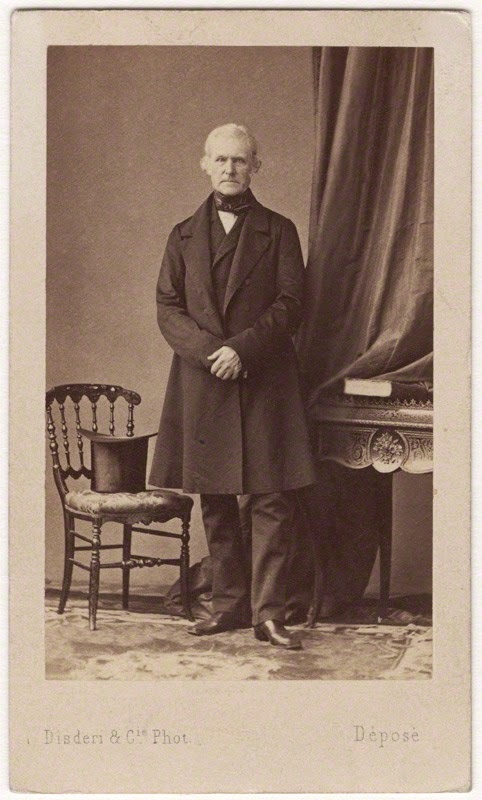 Stratford Canning, 1st Viscount Stratford de Redcliffe (1786-1880), was a British politician, an ambassador to the Ottoman Empire, and a cousin of William Pitt's friend and political associate, George Canning. In his memoirs and private papers, Stratford makes several interesting mentions of Pitt that are worth recording for the little insights we can glean about Pitt's character. In his school days at Eton in the mid 1790s, Stratford recalled seeing Pitt and Addington at Windsor Castle, wearing "the new court uniform, of which scarlet breeches were a conspicuous portion" . 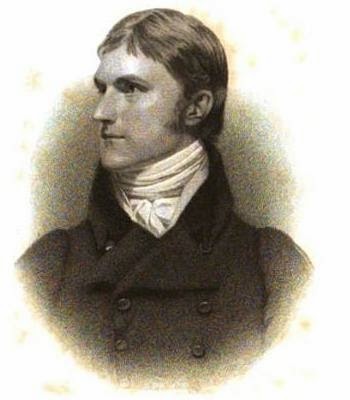 At around the same time, he was also able to watch Pitt during a debate in the House of Commons, and catch a glimpse of him going to St. Paul's Cathedral for a Thanksgiving service following several British naval victories against Napoleon. "I was old enough to listen with awed attention to a speech delivered by William Pitt. There was something singularly consistent in the principal qualities which combined to form his character as the minister of a constitutional monarch and the leader of a representative assembly. His features, though plain, were imposing; there was an air of natural command in his person; his voice was sonorous; he was at once without effort master of his subject, his language, and his arguments. From a window in Fleet Street I saw him [Pitt] go to St. Paul's with the grand procession of the King, Lords, and Commons, which went to return thanks for the great naval victories of the time [I believe this dates from after Nelson's victory at the Battle of the Nile]. He [Pitt] was more admired than popular, and his reception by the public partook of both sentiments. At one moment he might be seen bowing to a chorus of cheers and a display of waving handkerchiefs; at another, he slunk out of sight while the dense air of London seethed with hisses, groans, and reproaches. " "Conceive him [Pitt] once more in the House of Commons as my own sight beheld him not long before his death. The House was crowded; all the chief leaders of opposition were in their places; the Minister [Pitt] rose to speak; he was greeted with that sort of insulting noise from the opposite benches which boys at Eton sometimes make for the annoyance of their master. Mr. Pitt, without more change of posture than was necessary to place his hands upon the table in support of his tall advancing form, looked for a few seconds in silence into the noisy ranks, and said, in tones of resistless power, 'Am I to be interrupted by clamour?' The effect was complete, and an impartial spectator might have perceived in it the triumph of a supremacy sustained on the whole during twenty years. " "...I was still at Eton, and I can never forget the impression made on the whole school - masters and boys - by the announcement of his death. A passage in Virgil in the lesson of that day struck me as singularly applicable to the event: Utcunque fervent ea facta minores, Vincet amor patriae, laudumque immensa cupido. " Pitt's sense of duty, and a powerful love for his country, was burned into Stratford's memory. Several years after Pitt's death, in about 1810, Canning visited Pitt's niece Lady Hester Stanhope. He was fond of her company, and enjoyed her conversations - especially when she was speaking about her beloved uncle. At the time, Lady Hester was travelling with her much younger lover Michael Bruce, Mr. Pearse, and her physician Dr. Meryon (Canning misspells it as 'Dr. Merriman'). Many years later, he recollected her witty conversations with a surprising degree of clarity. Yes, Pitt was not known for the organisation of his papers, and they were found strewn about all over Walmer Castle and Downing Street at the time of his death. His executors, namely Bishop Tomline, took months to sift through (and probably destroy) most of Pitt's private correspondence. I blogged about the fate of Pitt's papers in a previous post. On the direction of Lady Hester Stanhope, Pitt's last private secretary William Dacres Adams arranged for someone to hurriedly gather up Pitt's correspondence at Walmer Castle before Tomline could get his hands on them. Most of these ended up in Dacres Adams' possession for the last fifty years of his life, subsequently being inherited by his descendants until the majority of them became the property of the British Library in 2012. Canning remained actively interested in politics and world affairs until his death at the age of 93 in 1880. 1. Lane-Poole, S. (ed.) (1888) The Life of the Right Honourable Stratford Canning Viscount Stratford de Redcliffe, from his Memoirs and Private and Official Papers (Volume 1). London: Longmans, Green & Co., p. 16.